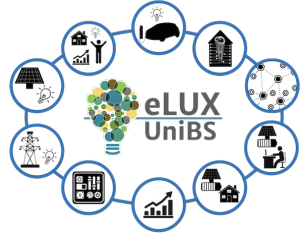 eLUX – Energy Laboratory as University eXpo – is the Health&Wealth laboratory of the University of Brescia developed under the Smart Campus as Urban Open Lab project (SCUOLA). Starting from the “Didactic Module” building located within the Engineering Campus, eLUX is a 24-hour eco-exhibition and didactic building, used as an experimental site for energy saving projects, for the implementation of renewable energies and innovative technologies, smart grid and building automation. eLUX is an educational expositive eco-building scheduled for a 24 h profile of use and thus always open and available. eLUX is where “learnscape” takes place, and events to promote experimental experiences and augmented knowledge are enabled. Moreover the users/students’ experience will be the core material to implement the concept of “cognitive building” to deliver tailored services for you. eLUX could dialog with digital interfaces and will adapt itself learning by the users which are learning in the eLUX spaces in a virtuous loop of advanced knowledge.